"Playing rugby, or out socialising with family and friends." "‘Fleetwood Mac – ‘Go Your Own Way’"
"Craig David – Born to Do It"
"Forrest Gump. That guy has had quite a life." "People that talk about brownies, people that eat brownies, people that give me brownies." "People speaking with a mouth full of food." "I wouldn’t want to eat with any three people – I would prefer to eat with my family." "Hitting the snooze button, people providing me with food and Alfie the dog." Adam has worked here at Pen-Life since 2013. He is Dedicated Support to our Financial Planner Deb Jacobs. 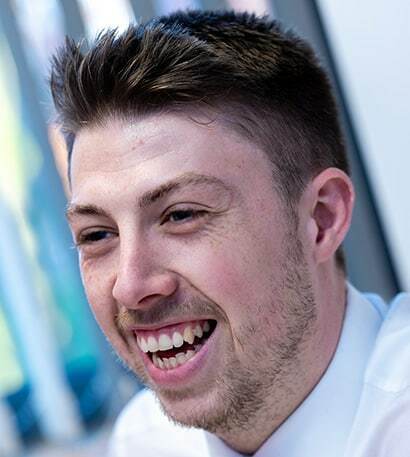 Adam’s role involves managing all the work that goes on in the background for Deb’s clients: from paperwork to client communications, Adam’s role varies from day to day. Adam’s main love is watching and playing sport. He plays rugby for York City Knights. Every now and again he likes to have a dabble at betting; sometimes more successfully than others!